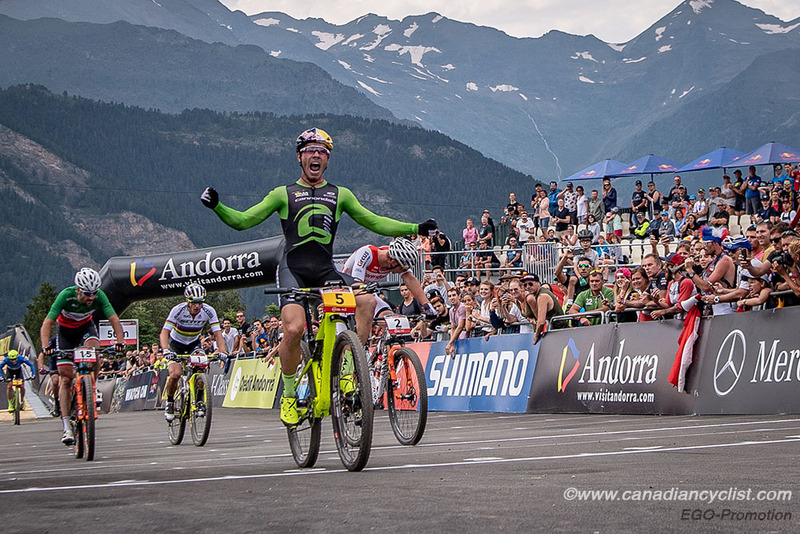 Round 4 of the XCC short track series at the Mountain Bike World Cup saw new winners in both the women's and men's races in Vallnord, Andorra, on Friday. Alessandra Keller (Thomus-RN Racing) won the women's event, while Brazil's Henrique Avancini (Cannondale Factory) took the men's. Avancini became the first Brazilian to win a Mountain Bike World Cup in any discipline. Emily Batty continues to show her strength, finishing fifth in the women's race after riding near the front all race. Other Canadian results include Sandra Walter (Canadian National) in 14th, Maghalie Rochette (Clif Pro Team) in 24th and Haley Smith (Norco Factory) in 26th. 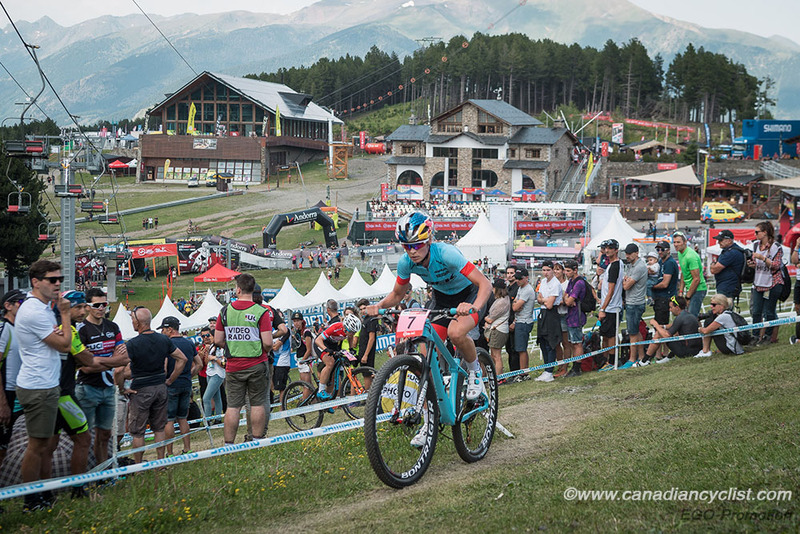 Walter will start on the second row for the XCO on Sunday with her result. There were no Canadian men racing. "Today I focused on my start and was successful at not losing too many spots from the gun," said Walter. "It was hard for me to know where I was in the field, and when I heard I was in the 20s, top-16 looked really far away. I felt like I was paying for my early efforts and losing momentum, but suddenly several riders began coming back to me and at some point, Jeff Ain [Cycling Canada NextGen Coach] yelled that I was in 16th. Obviously, that was motivating, and I managed to find more in the tank to secure my second-row start in the XCO on Sunday. I've never started a World Cup in the first two rows before, so I’m really excited about it. It was great to see Emily [Batty] up there too. I've had world-class support these past two weeks, and I really enjoy spending time with the awesome group of athletes, support staff and coaches on this Cycling Canada Project." The 930 metre circuit featured one climb, but lots of narrow twisting turns that hindered passing. Of equal concern was the 2000 metre altitude that would tax riders in this 20 minute event. 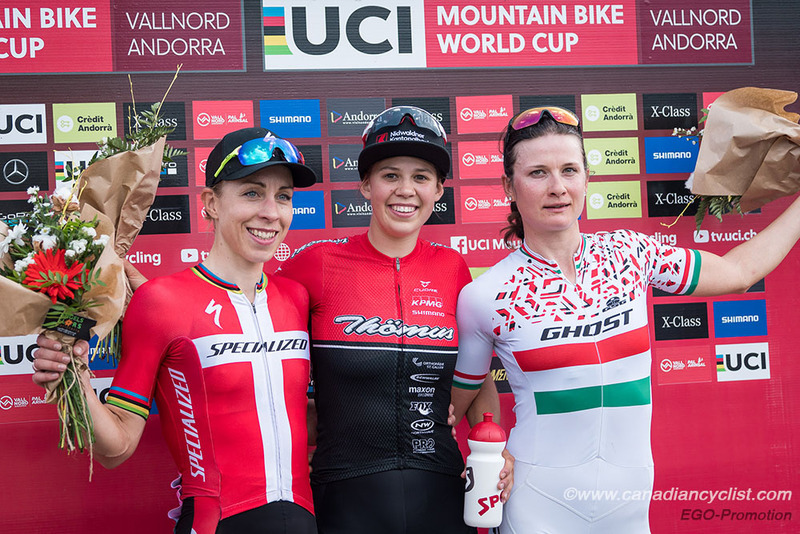 Langvad was the favourite after having won every previous event, however, a crash and wrist injury at the Val di Sole World Cup a week earlier made her a bit of a question mark. World Cup leader and world champion Jolanda Neff (Kross Racing) took the lead in the early laps, closely followed by Keller and Langvad. 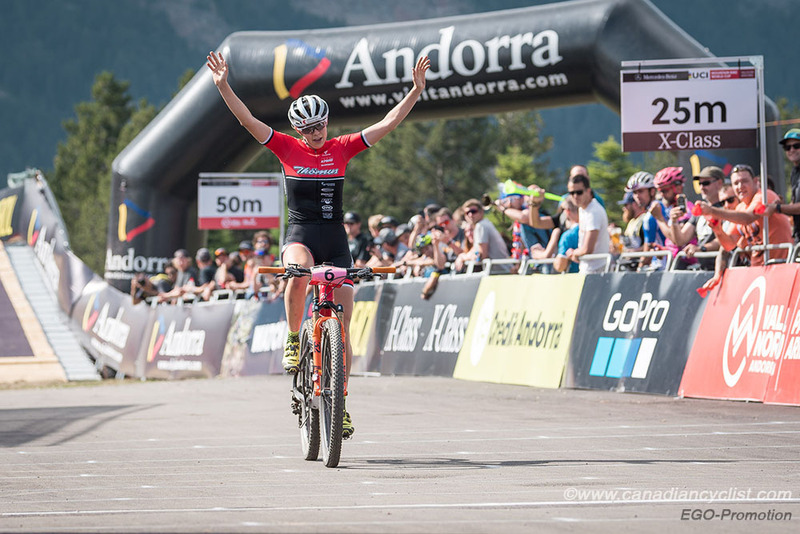 Neff faltered on the climb on the penultimate sixth lap, and both Keller and Langvad went by and dropped her, with Keller then gapping Langvad on the twisting descent, holding on through the last lap to win solo. "It's incredible to win," said Keller. "I'm still Under-23 and I'm already having an incredible season. The other girls are so strong and Annika has already won three times, so it's amazing to win. I felt good from the beginning on the steep uphill, but short track is so tough that you never know if you can hold on for the whole lap." Neff continues to lead the overall XCO World Cup standings after finishing third, but her lead over Langvad has dropped to 27 points. Batty remains seventh overall. 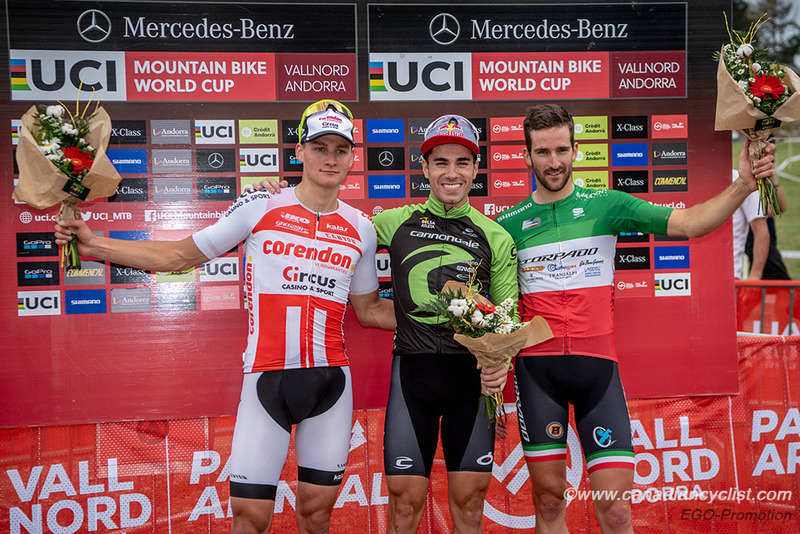 In the men's race, World Cup leader Nino Schurter (Scott-SRAM), van der Poel and Round 2 XCC winner Sam Gaze (Specialized) took the early lead, with Avancini bridging up and moving into the lead on the second lap of the eight lap race. Avancini stayed at or near the front for the rest of the race, marked by van der Poel, Schurter and Gerhard Kerschbaumer (Torpado Gabogas), and then rode them off his wheel on the final climb, holding on to win by a bike length over a late charge by van der Poel. "It's amazing to win," said Avancini. "To win the short track is an amazing feeling. I've always had really strong legs, but I was getting lost in the middle of the races, so I discussed it with my team, and we delivered the plan. I was trying to control the fast guys - Nino, van der Poel and Gaze - and I had crazy good legs. This win goes to Brazil." Despite finishing fourth, Schurter continues to lead the overall XCO World Cup standings handily, with a 285 point gap over van der Poel.